Hello everyone. Lena, here today to share a Christmas card with an ornament shaker element. I would also like to show you how easy it is to incorporate dies with other card elements. In this case, I added my die as the focal point on a stitched card. So, let's get started. First I stitched the frame with embroidery floss, and then began working on my shaker. I used one of the ornaments from the Ornaments 2 set from Elizabeth Crafts. I took the base piece and cut a hole in the centre of my stitched frame and in the centre of a piece of white craft foam. The card is cut to 5" x 5" and the foam to 4.75" x 4.75". I cut a piece of acetate about 3" x 3" and placed double sided tape adhesive on all four sides and adhered it to the back of the ornament opening. This will create my "window". Next I adhered the foam. I always rub the opening of a shaker card with my anti-static tool. This will prevent anything getting stuck to the glue that sometimes seeps through on the sides of the window. I cut out the ornament shape out of red mirror cardstock, and adhered it to the acetate. When I placed the panel on the card, I didn't like the red background. Too much red since I was planning on using red microbeads in the shaker, so I adhered a 3" x 3" piece of white card as the closure to my "window" after I had placed the microbeads in it. Lastly, I adhered the whole panel to a 5.25" x 5.25" red card base. As a finishing touch, I added a little bow and a few gold flat backed pearls to the centre. All that was left to do was the inside of the card. 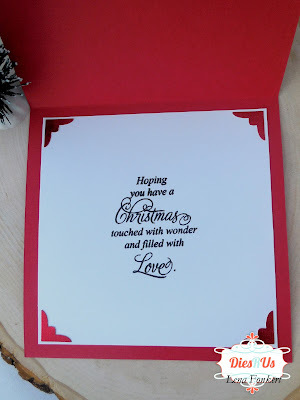 I added a few fancy corners that I had left over from another project and stamped my Christmas greeting. This is a stamp from the Christmas Sayings stamp set by Creative Expressions. WOW! I love all things Shaker, but that stamped frame and your stitching is AMAZING! What a gorgeous creation! YOWZA! Absolutely beautiful shaker ... what a fabulous idea! Thanks for amazing inspiration for the upcoming holiday season! Whoa! Hallmark does not make cards like this. This one is so specialss and it is a work of art. Such a beautiful card. I hope the person receiving this realizes how special it is. gorgeous card! I love this one!